Today was the first day of the international food and wine festival at Epcot. We'd never been here when the f&w was on in the past so we were very excited to try it out. We got the resort monorail round to the transportation and ticket centre and then hopped on the Epcot monorail arriving at Epcot at 10.45am. Bag check was rammed but moving quickly and took just over 5 minutes to get though. The annual pass queue for the tapstiles was empty so we were then in the park very quickly. We decided to head to the festival centre to check it out but it was so busy we decided to return later on in the day. 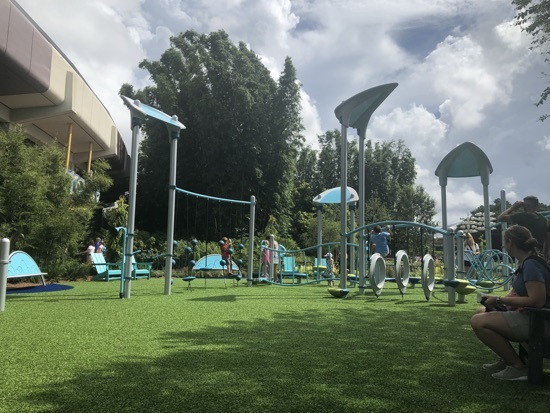 I was wanting to catch the spectaculab science show but we had about 40 minutes until the next one so we took dd to the family play area near mousegears. This is a small playground area with things to climb on, dd was in her element. 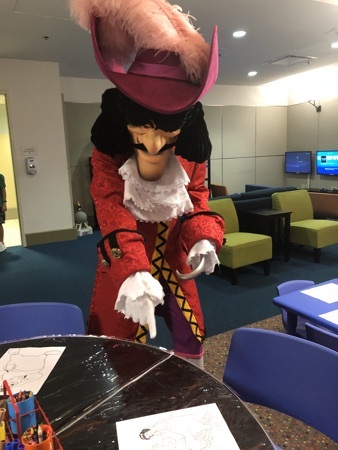 Whilst we were there a Disney production representative came over to ask if it would be alright if they filmed and photographed dd on the playground to use in promotional material for the food and wine festival. They got us to sign a permission form and gave her a special pin as a thank you. 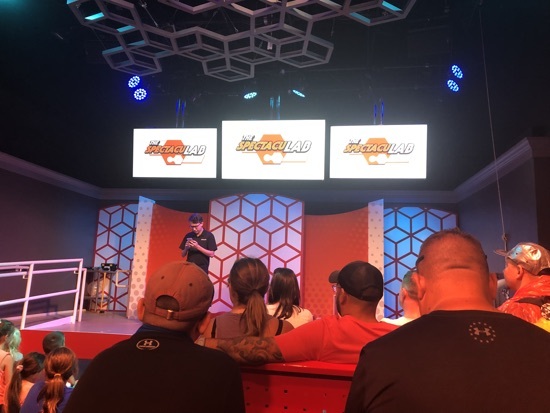 We managed to make it over to innoventions in time for the 11.45am show of spectaculab, this was a fun science show about pressure/force/acceleration. 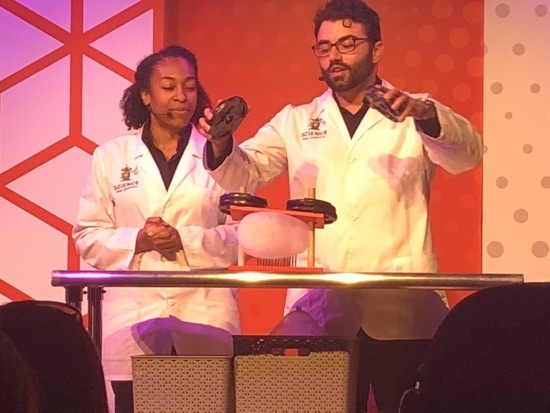 Being a physicist it was right up my street, dd even took part in one of the pressure demonstrations on stage. When the show finished we spent some time checking out the colour exhibits in the pavilion too. Dd particularly enjoyed the magic paintbrush mural where you paint a picture using an interactive magical colour paintbrush. We were feeling hungry by now and keen to hit the food and wine booths. 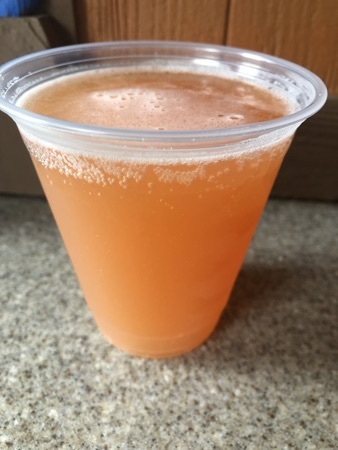 As we walked through future world we decided to call into club cool as dd loves trying the different drinks, who am I kidding?! We all do! Just outside club cool we spotted Craig and Ryno from the dis unplugged. Admittedly I was a little star struck as these two are 2 of my favourites from the show! 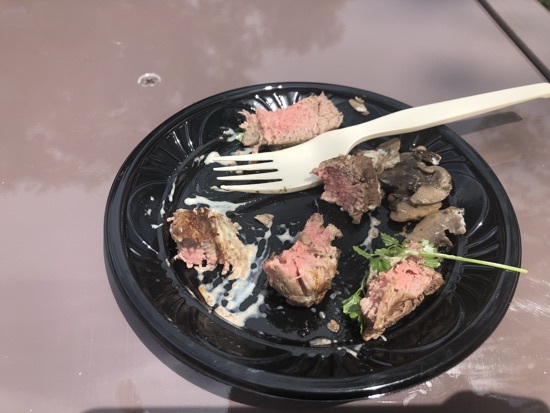 We got to the world showcase and our first stop was canada where we got a le Cellier wild mushroom beef fillet mignon with a truffle butter sauce, this was $8 and pretty small but very tasty! It was cooked perfectly and was melt in the mouth. 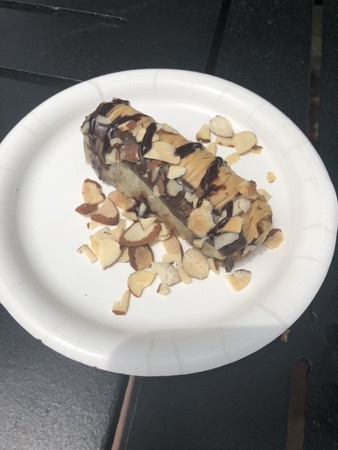 We continued round to Morocco where we shared a chocolate baklava, this is rolled phyllo bough with toasted almonds and dark chocolate sauce. We all really liked this, especially dd. This was $4. Next stop was the hops and barley booth in the American adventure pavilion. We got a New Brunswick slider here for $5.75. 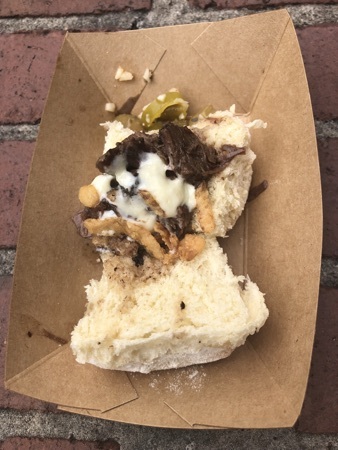 This was slow braised beef brisket pot roast style, with horseradish cream, crispy fried onions on a potato roll with pickled vegetables on the side. This was disappointingly small. Having had a slider from the flower and garden booth in exactly the same position as this booth at Easter that was easily 4 times the size of this for the same price, it made this seem poor value. It also had quite a lot of heat to it so dd wasn't impressed. 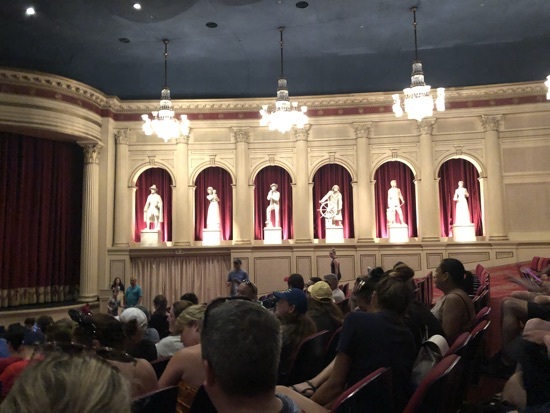 After our food we called into the America's pavilion to watch the American adventure show, this is something we have never done, we thought it was ok, we were impressed by the size and grandeur of the theatre it is shown in. 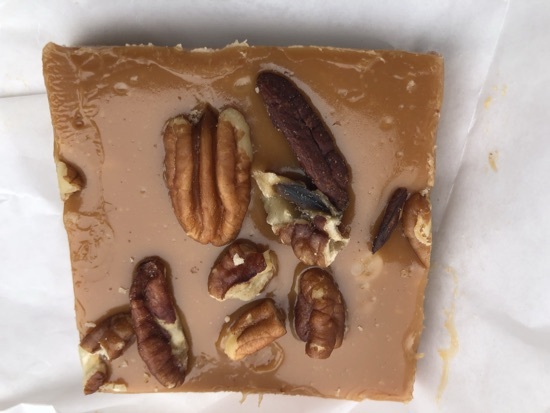 When we came out we carried on round to germany, here we went into Karamel kuche instead of a booth, I got a caramel pecan bar, this was shortcake topped with werthers caramel and pecans, it was absolutely amazing! Cost was $3.99 and I could eat this again and again, we all agreed it was lovely! 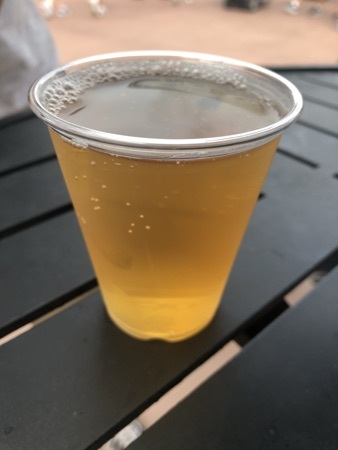 Just along from here we got our first drink from the brewers collection booth, we went for the schofferhofer hefeweizen pomegranate beer this was $4.25 for a small glass and tasted pretty good but we agreed we prefer the grapefruit version. 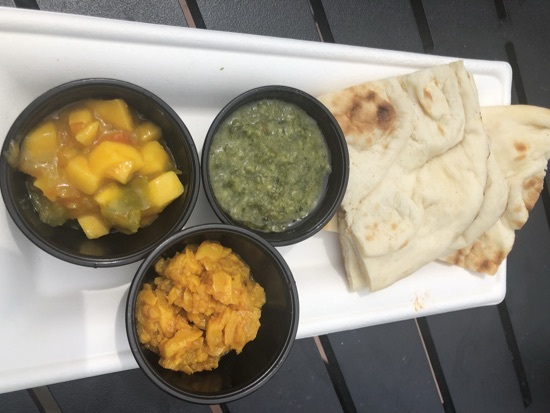 As we neared China we came across the India booth, DH was undecided what to get here as it all sounded so good so he settled on the warm Indian bread with pickled garlic, mango salsa and coriander pesto dips, this was $4.75 and all 3 dips were delicious. We especially enjoyed the coriander pesto. Back at the showcase plaza we came across the Thailand booth, another one DH was looking forward to, we picked a dish each here. 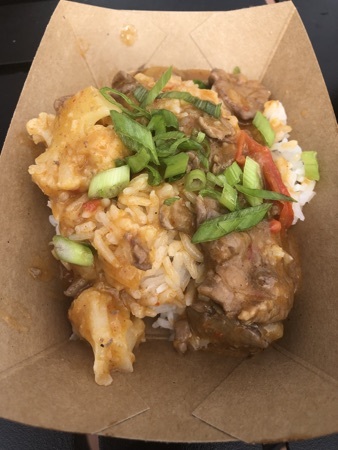 DH had the red hot spicy Thai curry beef with steamed rice, this was $5.50 and he enjoyed it, it had abit of heat to it but not too over the top. 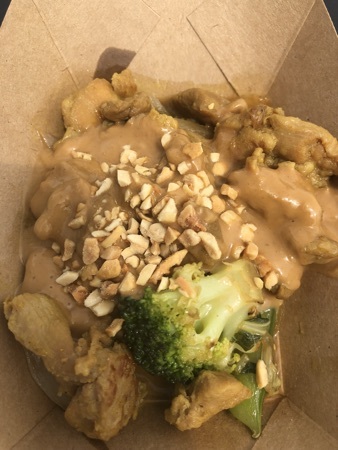 had the marinated chicken with peanut sauce and stir Fried vegetables. This was my favourite thing so far, really good and cost $5. 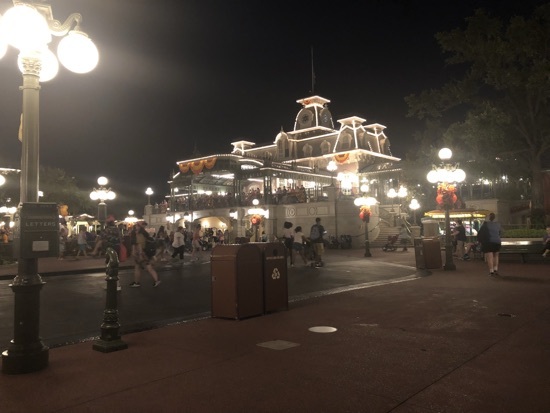 We decided to do another lap of the world showcase and finish off DDs Epcot passport, as we walked through the showcase plaza we came across the dis unplugged people again, this time Steve and Charles were there with them too. We carried on towards Canada and UK collecting the traveller cards and getting the passport signed. In France DH watched the impressions of France film while dd and I coloured at the kidcot station. 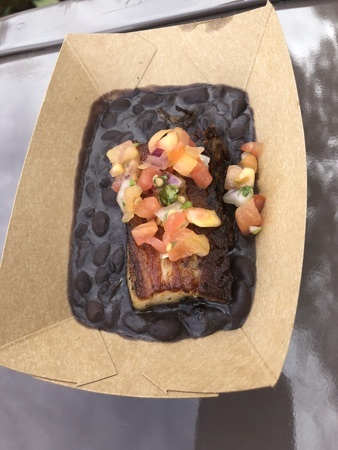 We got asked towards Morocco and DH spotted the Brazil booth, here he got the crispy pork belly with black beans, tomato and onions, he thought this was really nice, whilst he ate this dd and I queued to meet belle as the queue was really short. After our character meet DH got us each A Stella Artois hard cidre for $4.25, we drank these as we walked through Morocco. 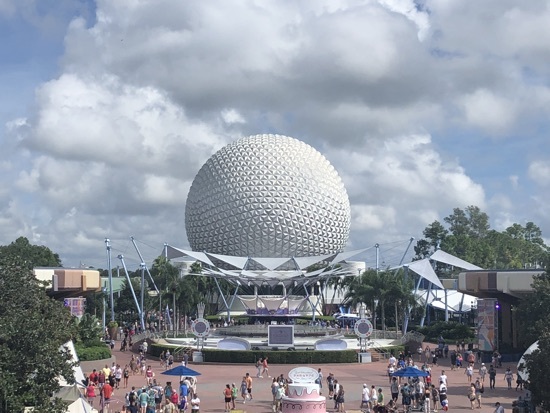 We completed the rest of the Epcot passport by visiting Japan and America and continued on down to Germany. 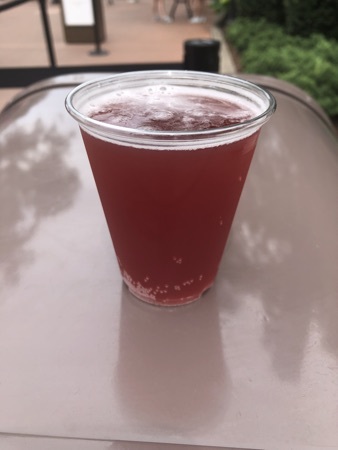 Here we only had one thing we wanted the schofferhofer hefeweizen grapefruit beer, we got one each for $8.50 and it was a lovely as usual. We drank these as we made our way round the final stretch of the world showcase and back towards the festival centre. 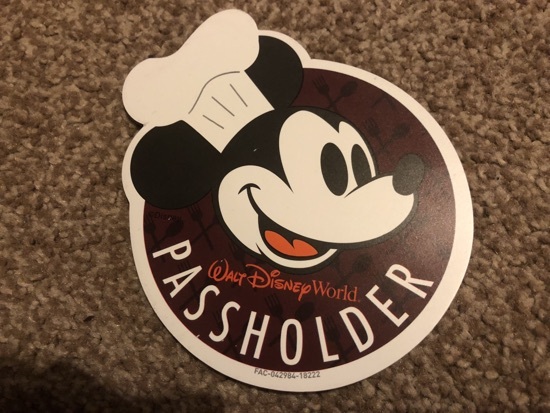 We called in and got our pass holder festival magnets. These will join our 2 from the flower and garden festival on our fridge. We looked round the Ghirardelli exhibit and got a caramel square sample each and by now it was time for our test track fastpass. After a quick blast round the sim track we walked over to mouse gears where I decided to buy the pass holder pandora charm. 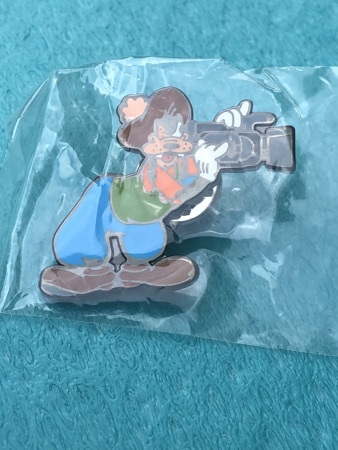 This was $55 with 20% passholder discount. We were now undecided what to do, we were wanting some dinner, we had a fastpass for soarin abit later and DH wanted to catch happily ever after back at magic kingdom as it was our last chance to watch it this trip. We made the decision to catch the monorail back to the TTC and walk round to the grand Floridian and have some dinner at gasparilla grill. 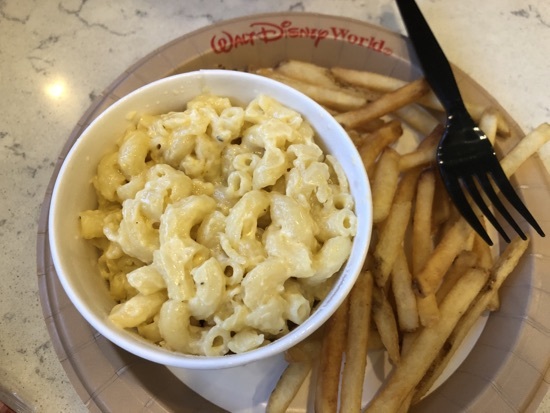 Dd had the mac and cheese kids meal with fries, grapes and chocolate milk, this was $6.99. 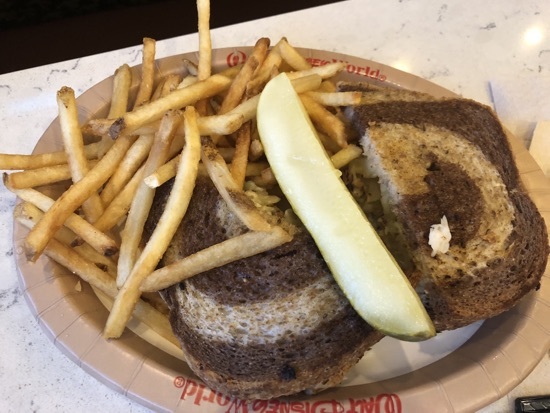 DH had the blackened fish Reuben with fries, this was $12.99 and he enjoyed this, it was something different. 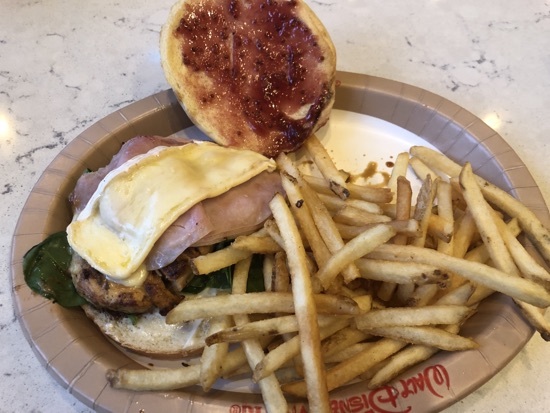 I had the chicken, ham and Brie sandwich with fries for $11.49, this was absolutely delicious! I loved this sandwich and could eat it any time! After our dinner we got the monorail round to magic kingdom where we hung out in the town square before watching the fireworks. DH is a total convert to happily ever after and now totally prefers them to wishes. New Photo Added by missdopey - 3 Sep 18 10:05 PM. I wanted to see what the bread and dips looked like . Looks like a great day. What a magical end to your day.